Journey to Al Kamil is monotonous and boring ,I can only see the trees and endless rocky hills along the road.The story begins when we leave the village Jaalan Bani Bu Hassan and head for the rocky path leading somewhere to the south. On the map, everything looks easier ,80 km dirt road to do it for less than an hour and we will be on the Indian Ocean coast. At first all this also suggests, the path is clear for about two kilometers and just to make sure we are on the right track we are stopping to ask old man with a long beard about the direction to coastal village Qurun , which has to be a shortcut somewhere in the desert . The man disagrees, showing the new asphalt road somewhere at the end of the town saying that’s the safest and the easiest way how to get there via Al Ashkharahwhich, but then he shows right hand and says something to go along the road and keep on the left only. We are smarter and map still clearly says that you need to go right, we thank to an old man and go further. Rocky sand panorama changes suddenly with number of camels with riders, hurrying back into the fold, we are just beside the camel racetrack. After 40 km we take pictures first scoops of desert, the map is telling us sand dunes will be on our right side. The trip ends soon, however, so without thinking I follow sandy road leading into the wild.The path in the sand is getting closer and we start to worry. After a few kilometers of sandy terrain, the landscape is changing rapidly with rocky valley , the grass will replace the wilderness of sand, trees and electric wires which that makes us such an orientation-which way to go. When the path splits, and will do so even our minds, we begin to doubt about our crazy idea to cross the desert in this adventure. Bedouin quickly and skillfully rides among hilly ​​sandy desert, where we foolishly wandered. 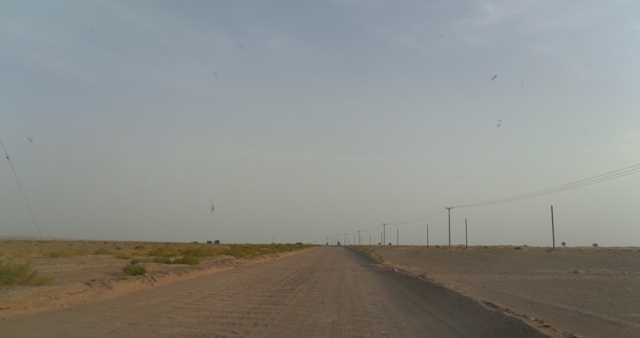 After driving a few kilometers across the rugged wild country Bedu flashes and shows where we are going and even doesn’t stop for greeting .He quickly disappears in the distance. We continue slowly further to the south, but we give it a while and it becomes dark and does not make sense to go on like this. We stop at the tip and pitch a tent. We are eating kid meat, which brought us the day before Faiz on the occasion of the feast of Eid. I silently sit in front of a tent with my wife and our heads have gloomy thoughts. We got lost in the desert, a place where every mistake is punished harshly and knows no compromise. I think, rational appreciate onerous situation and try to find the positives. In the distance you can see the car lights, thus Bedouin village is not faraway. I look on the map and by phone determine the coordinates of the current position. Relatively accurate map is here equal to the price of gold. I’m counting , writing and measuring our position. From the original route, we deviated a good chunk of the way into the interior, into the inhospitable desert. All around is just sand and tufts of grass islands and desert trees, where resting only the goats. Fortunately, armed with a few days rations of food,water and especially gasoline. Therefore we spend the night here in the desert Ash Sharqizah. I fall asleep constantly addressing the problem that occurred. Just not to do another mistake, I repeat to myself. In the middle of the night when I can not sleep, I look once more into the map and try to find the reason why we mindlessly drifted away from marked trails. On the map, everything looks simply and clearly. Roads, mountains, villages and wadis marked and can be relatively easy to distinguish. The desert is often much more complex in reality, wind direction determines where the sand will move and even today known path becomes an endless pile of sand in a place where everything looks the same. Finally, I’m slowly falling asleep. Morning cannot be more strange. I wake up to roosters screaming in the distance somewhere in the oasis. Yet we are not alone, I think. I get up in the tent and to my surprise everything is wet. The tent we pitched very quickly and put only one layer leaving the outer in the car. There was a strange fact that at night it rained and water got inside our tent. Monica’s phone suddenly stopped working. Due to a rain that surprised us in the desert. The car lazily moves the sand and is struggling to crawl further step by step. Indeed, after a few kilometers, the road splits like a shepherd advised.Relatively easy is to get a broader way across infinite plane. The country is changing, the dunes were replaced by the plateau with the islands of grass. For a moment we are looking for direction, losing the waybut we are heading east, that is our goal. 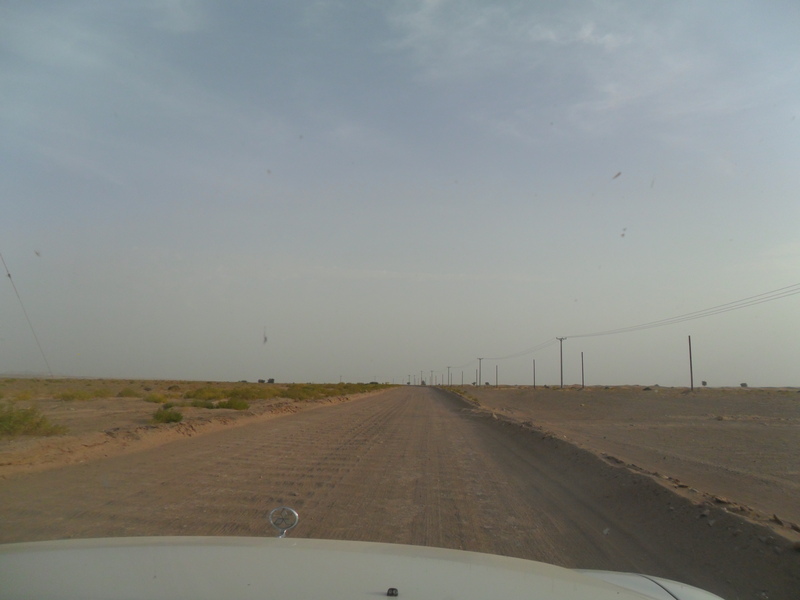 Again, we find good asphalt road and finally we come to Qurun, the place where we should have been the day before. This entry was posted in Oman and tagged desert, jaalan bani bu hassan to qurun, off road, Sharkiyah sands. Bookmark the permalink. Really cool photos. So different from where I live. I enjoyed the beautiful desert photos.